1/24 – I spent the day researching what is really going on behind the media cover up in the disaster areas. Here are the links of the day. In summary, i’m discovering that USDA issued checks for repairs but they can not be cashed until the government shut down opens the USDA offices. FEMA issued $425 checks (1x only) for emergency food and utility bills. 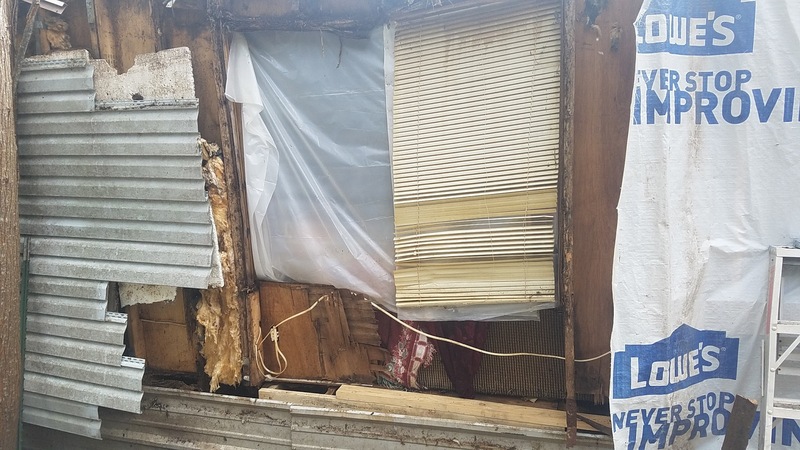 They also provided labor forces to install tarps over as many damaged roofs as possible but they only last until a strong wind takes them down again. 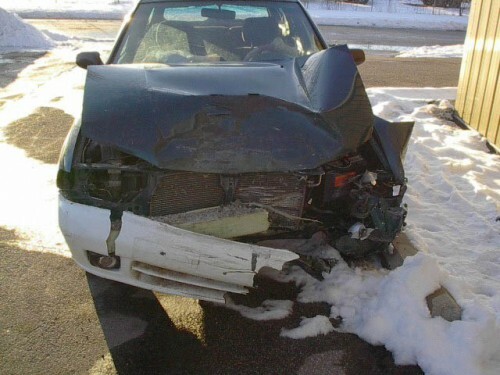 It is the best short term immediate repair at least. There were hundreds of thousands affected by this storm so the few FEMA trailers that were available were dispersed quietly to prevent large scale chaos. Locals are forced to stay in hotels because they have limited utility service and holes in their roofs. This has driven up the room prices while limiting space for construction workers. At the same time, campgrounds are closed due to damage or the government work shut down so there is limited camping for workers in RVs. Insurance companies are denying a lot of claims citing a flood insurance loop hole and they are setting $15,000!!!! 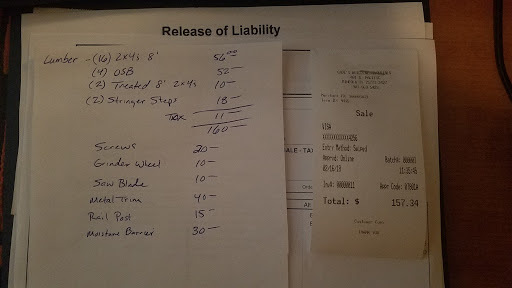 deductables which leave owners without enough money for the actual repairs. Without places to stay within budget, there are not enough workers so people have to wait so long that they are just giving up and moving away. I’ve been told people are scheduled 8 months out from a work date!!! Today we traveled over the central and eastern disaster areas. I have explored a lot of natural disaster areas over the years of volunteering but this is the largest storm in US history on a scale of hectares affected. Everywhere in aprox. a 100 mile wide by 300 some mile area north rectangled zone had major infrastructure damage. It is just mind blowing. If you ever watch war films you can visualize the imagery. There are a lot of people from the Wewahitchka area sending me information and stories about damage that can not be repaired. There are so many different reasons. We spent about an hour talking to people at the library where FEMA had a command center set up. We visited two county building commission offices and got liscense applications and packets in order to contract full roof replacements. By mid day I had not received any leads on qualifying volunteer projects and Ryan was not able to get a liscense until completing an exam which would take at least a week so we decided to head back west tomorrow. We spent the day in Biloxi MS and set up a plan to get Ryan’s paper work done so I would be able to update all the people who told us they were interested in our help. Heading back to my TX office to regroup at the Hawkins Learning Center! This month Helping Hands Network founder, Tim Frentz, publicly introduced the Hawkins Texas Learning Center fundraiser to the local community. The Network set up a booth at the Hawkins Festival and representatives of local media interviewed Frentz to help us spread awareness. The feature of this issue is about the Community Zen Center we are trying to fund in Hawkins Texas. This is an effort to provide a center for the community to learn about positive change issues like Gardening, Renewable Energy, Art creation and communal networking through events like shared meals & movie and game nights. This Blog is our record of small details regarding the Billionaires efforts and interests as well as those of others not listed on the Giving Pledge. The Helping Hands Network is often alerted to Causes in need and we use this master list to help match the Causes with the contacts listed below that can provide the help needed! To the Bill & Melinda Gates Foundation. To improve poverty. In developing countries, we focus on improving people’s health and wellbeing, helping individuals lift themselves out of hunger and extreme poverty. In the United States, we seek to ensure that all people—especially those with the fewest resources—can access the opportunities they need to succeed in school and life. To the Bill & Melinda Gates Foundation. Susan Thompson Buffett Foundation, Sherwood Foundation, Howard G. Buffett Foundation and NoVo Foundation. Jeff Bezos @JeffBazos — $?? To the Ressler Gertz Foundation. Grants from the foundation include $1.7 million to the LA County Museum of Art, $400k to Cedar Sinai Medical Center. To the Herb Alpert Foundation, which focuses on the arts, compassion, and well being. To the A.P. Reilly Foundation, which he started to support Holy Family Church. To Lucas Film Foundation then granted to The George Lucas Educational Foundation with a mission to inspire and empower young people to become responsible citizens, compassionate leaders, and to live their dream. To the Nora Roberts Foundation, which support literacy. Additional areas of focus are: children’s programs, arts organizations, and humanitarian efforts, with local organizations being its priority. $2 million to the Nebraska University athletic department and another $600,000 to the University of Nebraska-Lincoln College of Engineering to endow a scholarship. It is the largest single gift ever from a former football player. To The Lord’s Fund, a foundation they established. Grants include $400k to Josiah Venture, a Christian youth movement in Eastern Europe, and $113k to Children’s Cup, a Christian organization focusing on “forgotten children” in Swaziland, Mozambique and Zimbabwe, and efforts are also underway in Vietnam and the Philippines.. Most of their giving is to Christian-based organizations. To Silver Mountain Foundation for the Arts, a foundation they established. Grants include $100k each to Oxfam America and Partners in Health; $1,225,000 to Vassar College. Total grantmaking for the year was more than $2.1 million. To Carsey Family Foundation they established. Grants include $250k to Media Matters for America, $100k to Institute for America’s Future, $50k to Progressive Talent Initiative. To The Sam Simon Foundation to “save the lives of dogs to enrich the lives of people.” The Foundation manages a number of programs including a mobile veterinary unit, dogs for veterans, and dogs for people who are deaf or hard of hearing. To the Seinfeld Family Foundation that supports education, children’s services, health associations, and Jewish organizations; funding also for the arts. To the Barbra Streisand Foundation. Grants are distributed to a variety of charities and causes including the Barbra Streisand Women’s Cardiovascular Research and Education Program at Cedars Sinai, City Year, and the Natural Resources Defense Council, respectively. To the Just Keep Livin’ Foundation that he established. Grants distributed include $88,000 to Communities in School Los Angeles West and $38,000 Communities in School Central Texas. To the Dean and Gerda Koontz Foundation. Grants include $750,000 to Canine Companions for Independence and $500,000 to Saint Michael’s Abbey in Silverado, CA. To the Red Cross for Haiti Relief. To the Isabel Allende Foundation to support charities that empower and protect women. Founded in honor of her daughter, Paula Frias who passed away at 28. Grants include $500,000 to Oritel, which provides human services for low income families and $30,500 to the Global Fund for Women. To the Alec Baldwin Foundation. Grants include $50,000 to the NY Philharmonic, $42,500 to Waterkeeper Alliance, and $250,000 to the Carol M Baldwin Breast Cancer Research Foundation. To Doctors Without Borders for Haiti Relief following the devastating earthquake. To the University of Mississippi’s Ole Miss Opportunity Scholarship, which allows prospective students with an adjusted gross family income at or below $30,000 to attend the University of Mississippi. To the Will and Jada Smith Family Foundation. Grants included $126,000 to the Lupus Foundation, $200,000 to the Baltimore School for the Arts, and $52,000 to the Make-A-Wish Foundation. To Trust for Public Land to save the iconic Hollywood sign from being plowed under in order to make room for four luxury homes. To Carmelo Anthony Foundation. Grants include $500,000 to Syracuse University and $302,000 to The Living Classroom Foundation. To The LiveStrong Foundation, which he founded to improve the lives of people with cancer. To Jonathan and Faye Kellerman Foundation. Grants include $175,000 for Children’s Hospital of LA, $150,000 to USC/Kellerman Endowment, $25,000 to Boston Institute of Music. To the Mariano Rivera Foundation. Grants distributed included $150,000 to the Church of God Prophecy and $50,000 to the Brooklyn Tabernacle. $500k to Hands on Nashville the Community Foundation of Middle Tennesee for Nashville’s flood relief efforts (Nashville Rising); $25,000 to the Wyomissing, PA school district for educational $100,000 check to rebuild Kids Kingdom, a playground in Hendersonville, Tennesee where she attended high school. To Git-R-Done Foundation. Grants include $500,000 to the Child Advocacy Center and $525,000 to the Madonna Foundation. To Low Road Foundation he established. Grants distributed include $50,000 to the Foundation for Contemporary Arts. To the Davis Love III Foundation, which he established. Grants distributed include $479,000 to the St. Presbyterian Church, $100,000 to Frederica Academy, $75,000 to Special Olympics, and $75,000 to Boys and Girls Club of Southeast GA.
To Victoria Principal Foundation. Grants distributed include $25,000 to Greenpeace Fund, $125,000 to Natural Resource Defense Council, $100,000 to Oceana. No, not that thing our leader talks about that is demolishing our nation’s tourism industry. I’m talking about a wall to keep an elderly family warm this winter. Today we were told a story about an elderly Hawaiian in Texas that had no running water so she was driving back and forth 5 miles to the local lake to fill up buckets. Right away we went to meet her and connect her with neighbors that would deliver her water until the plumbing was fixed. 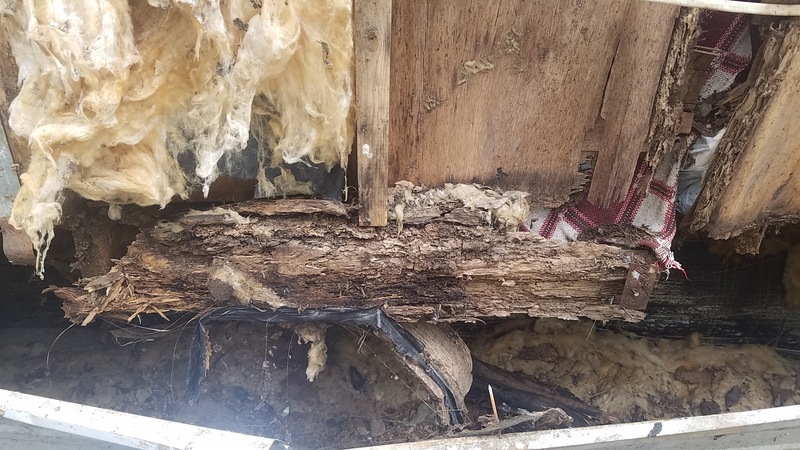 Next, we removed the foundation covering, dug out the flooded rubbish, dried up the crawl space and found the ruptured pipes. 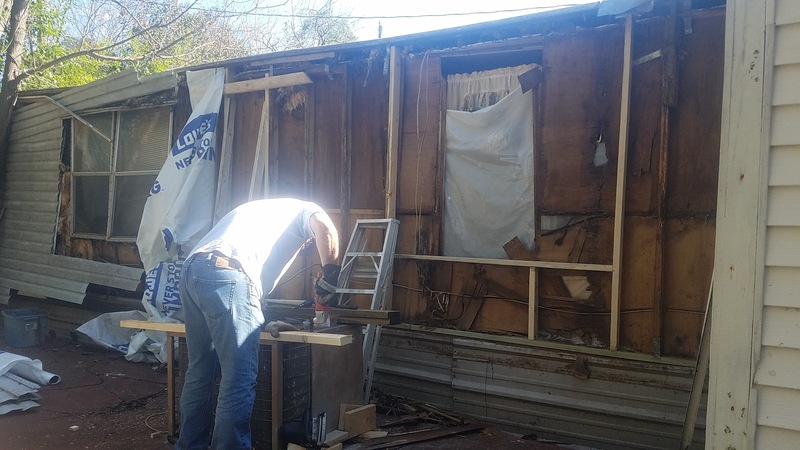 So, over the next few weeks will are raising money to cover the costs for lumber, insulation, plastic sheeting, plywood, screws, dump fee’s and volunteer lunches and transportation. 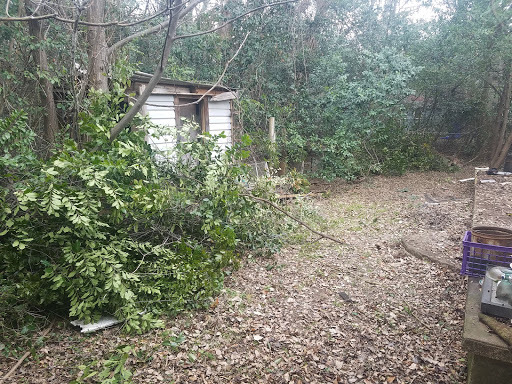 On 2/1/18 we clear cut the tree’s around the work area and the local mission and churches submitted their first round of collections totaling $105! Thank you to all those who are assisting this effort either by funding, volunteering or re-sharing on social media. Blessings. We swept off the patio and delivered the first round of lumber. Today we purchased materials and delivered them. 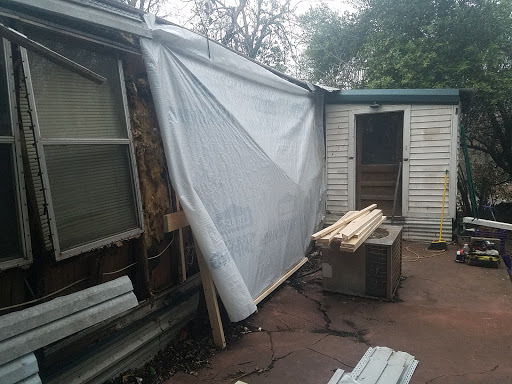 We demolished the rotten soffit, installed edge metal trim, removed siding, removed the rotten materials, installed a brace to improve the wall stability and covered the wall with moisture barrier. Today we were joined by FUMC Pastor Brian as we added some wall studs and framed in the first window. We are ready to insulate and sheet the first section on the far right. 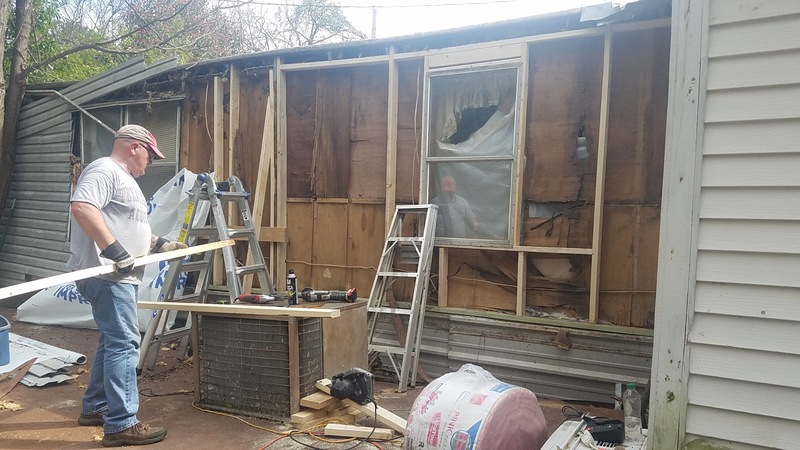 This week we installed more wall studs, installed the first window, insulated and hung the first 10 feet of wall board with moisture barrier!!! Volunteers from First United Methodist cleaned up the yard!!! We replaced the 3rd section of the floor joist under the double windows. 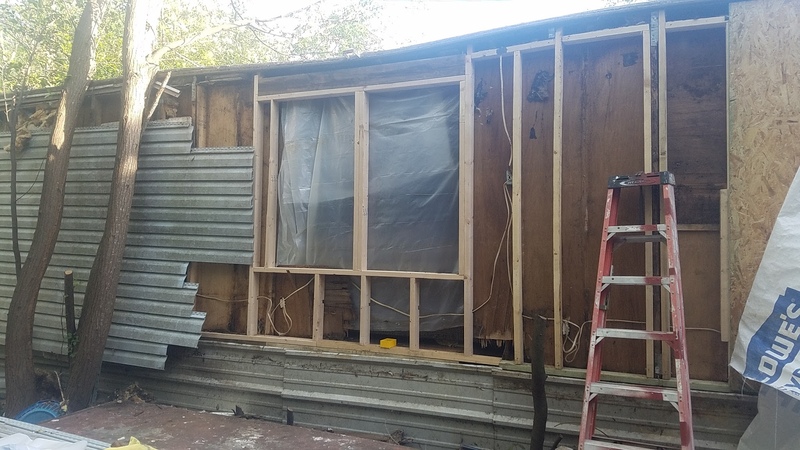 We are ready to finish the wall studs for the 3rd section and ready to frame in the double windows. 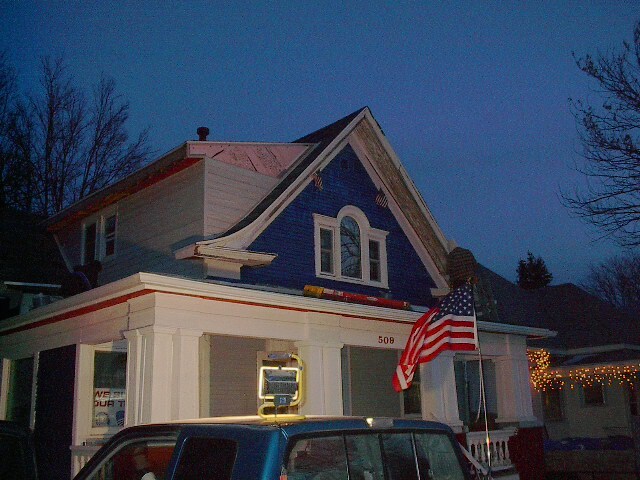 3/31 – This week we removed the last of the demo debris to prepare for the last of the framing. We then completed the framing and everything is ready for insulation and wallboard. 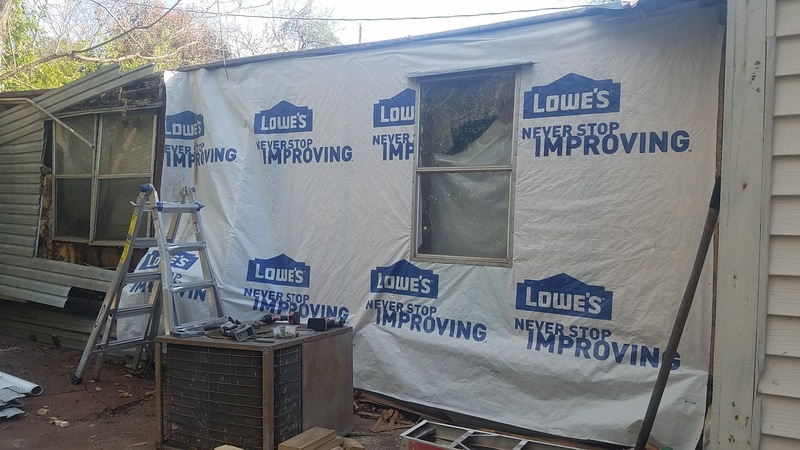 This week we prepped the windows, installed the insulation and covered up the wall with the wall board. One more work day left on this project. Next time we will install the siding and build the stairs. 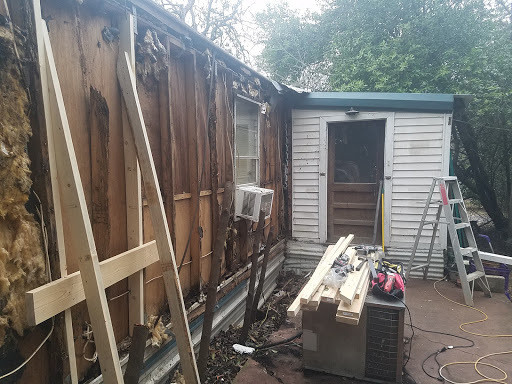 We installed the old siding. Here are 3 projects left that are waiting for volunteers. If you are interested in helping out, please message us to schedule a time. Debris needs removed. The air conditioner can be installed and the steps can be built. The following have sponsored this cause so far! *Interesting fact: Mr. Craine was processing the fact that he had just lost his phone and still opened his wallet while suffering the on coming panic attack. Thank you sir. GM has been a HHN Corporate sponsor for over 2 years now! Vanessa is distributing the flyer on the ground IN HONOLULU!!! Thank you very much. Thank you for submitting Lani’s Cause to us. The emergency support group coordinator at FUMC is Kathy Mordue. Their group has pledged to fund the remaining needs of this project! $500 was deposited 3/9 and it should cover the final costs. THANK YOU VERY MUCH FUMC! The cold weather is allowing me extra time in the studio and it feels great to get caught up on the HHN publishing. 2016 was so full of excitement that issue #12 will include 2 extra pages! It will be published tomorrow, Thursday January 18, 2018. Here is a sneak peak. 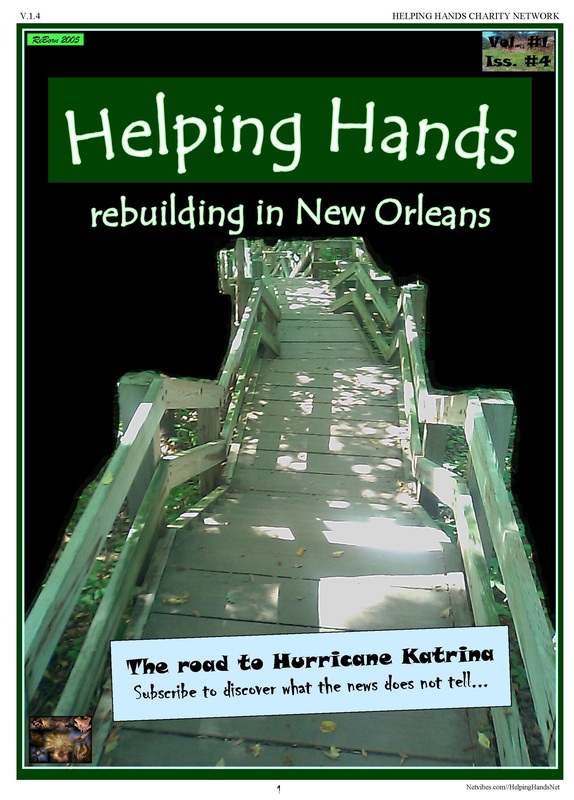 I hope it continues to inspire everyone to support the Helping Hands Network and all the causes we sponsor. We have been focusing on fundraising so fiercely the past 3 years that we let the graphic comic novel books get behind schedule. During the holiday break and the cold weather we have been working hard to get caught up. The 2015 issue will be ready very soon. Here is a sneak peek at what is coming. (Hawkins, Texas) THE EAST TEXAS TOWN OF HAWKINS IS ESTABLISHING A LEADING COMMUNITY PRESENCE TO DEFEAT POVERTY. 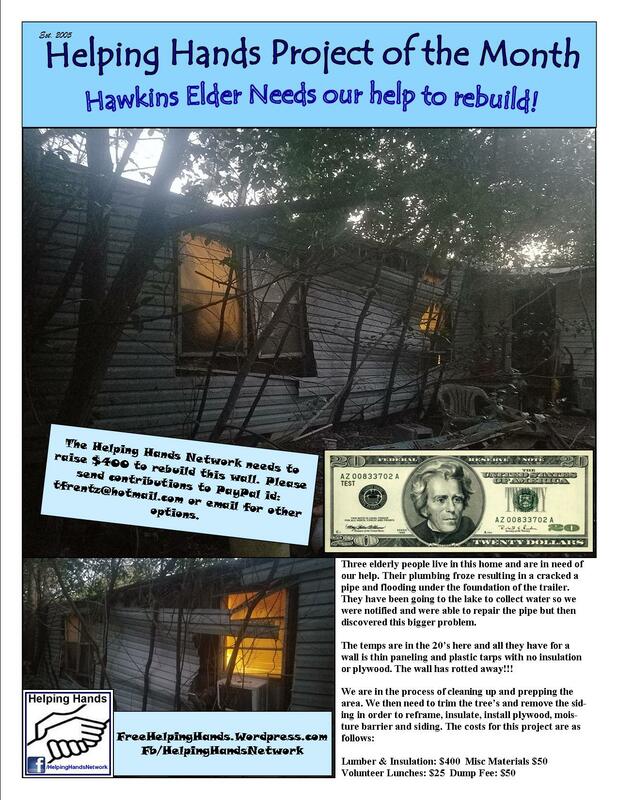 The Helping Hands Network (HHN) founder has spent 2 years building a support network in the East Texas community of Hawkins Texas. Business partners have been established; volunteers have been organized and trained; and now a community Education center is ready to be developed. First option to purchase the community center property has been offered to HHN and they need to raise $35,000 to finance and improve it. 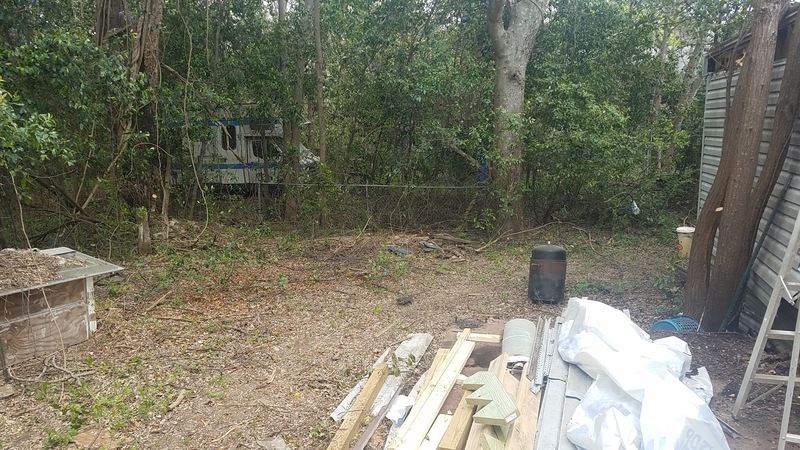 The location of the property is perfect for the newest HHN addition because there are several groups working together to improve the impoverished neighborhood. 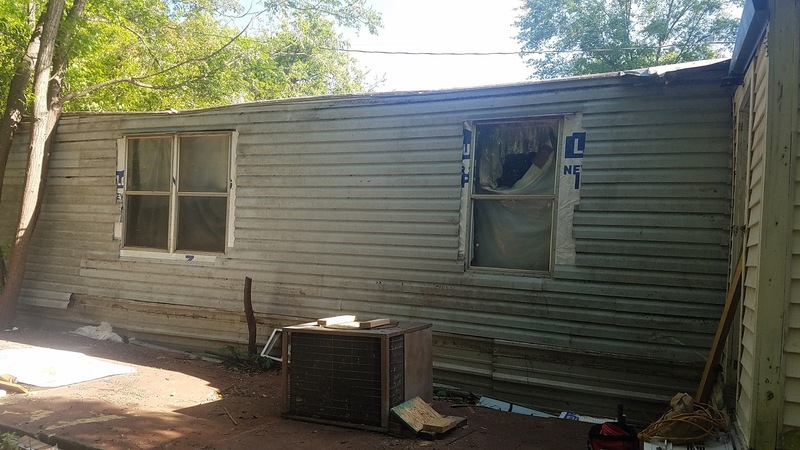 The Hawkins / Holy Lake Ranch area churches work together to support one central Helping Hand Mission to provide food, shelter and household emergency items to those in need. This mission is one block from the HHN education center. 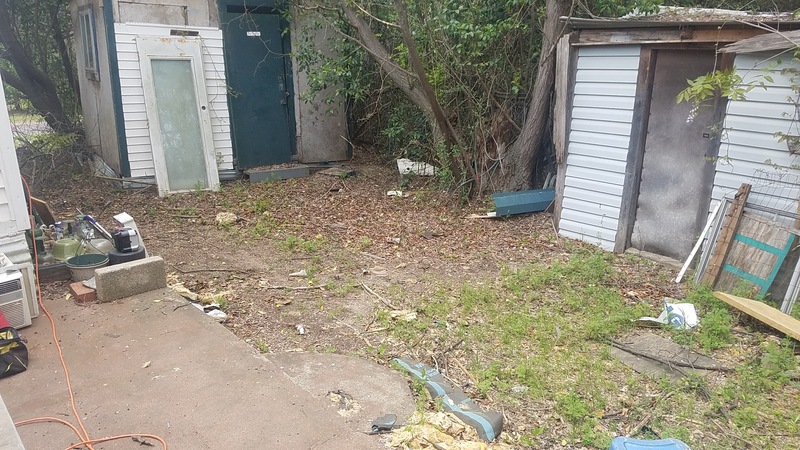 The Hawkins area Chamber of Commerce is developing a business incubator location to provide job training to help improve the poverty and homeless problems. This location is 2 blocks from the HHN site. The City of Hawkins has developed a community park with updated features on the same street as the HHN site. There is a partnering motel on the same street that can provide emergency shelter to those homeless during disaster relief situations. The HHN is working with these groups by providing business skill training, survival workshops, wellness classes and other wonderful events at the community education center property. The two story complex is perfect for the program. The upper level provides office space, storage and a wellness studio where visitors have events like yoga and movie/game nights. The lower level will be developed for emergency shelter, group meals, classroom training and art studio space. A community garden is in the second year of growth on the surrounding property. 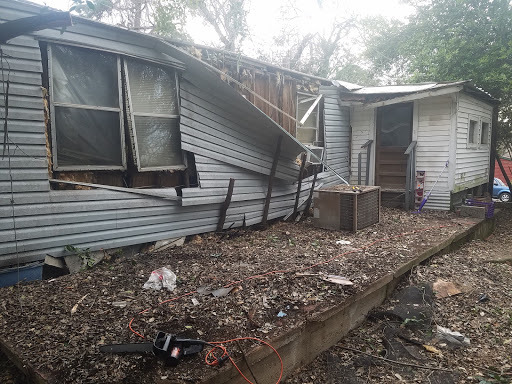 IF enough money is not raised by March 2018, the property will be sold to the public and the community center and garden program will be forced to start over so please donate if you can. Direct deposits via paypal ID (tfrentz @ hotmail) are preferred to accelerate the processing time. $500+ receives a 25% discount on 6 home repair service calls & 6 free tech services. $1000+ receives a 25% discount on 12 home repair service calls & 12 free tech services AND a voting seat on the Education Center Board of Directors. The Helping Hands Network started as the vision of one but quickly evolved into a global movement. In the fall of 1995, the founder, Tim Frentz was studying the role of business and advertising in society. He and a close friend got together to form a technology company. In 1997, at age 20, Tim nearly escaped death after being hit by a car while riding his motorcycle. After nearly 2 years of experiencing how technology could help the disabled, Tim had become temporarily paralyzed and used his own computer solutions for more then a year of recovery. TechCare, a specialty division was created during this time to provide in home technology training as well as other assisted living solutions. His home town paper even did an editorial feature on the business success. All appeared well, but then some major changes occurred. Tim and his father, Jerry, were very close and often adventured together. 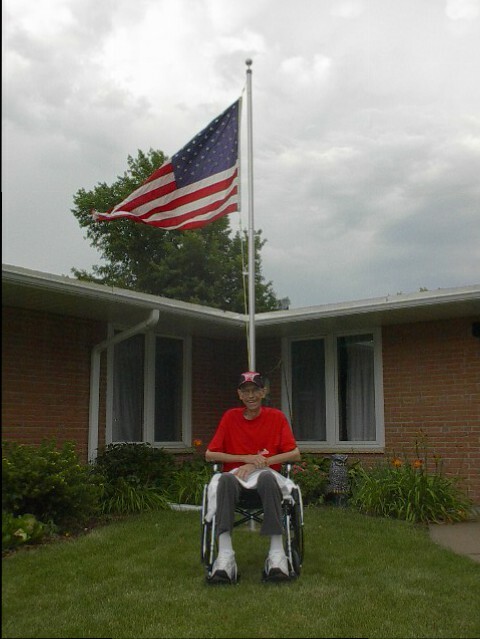 A few days a week they would escape to their home town area to work on rebuilding Jerry’s dream home. The two of them had trusted Tim’s financial partner to invest their nest egg money while they focused on their projects. One day, they went to ask for a few thousand and were told they couldn’t have it and no legal procedure would help them recover it. Jerry’s stress, as well as his poor health, quickly wore him down. Jerry became disabled by a series of heart problems and Tim was left with the overwhelming tasks of finishing the home build by himself. He also had a major project in the works with his own country home, as well as the troubles between him and his partner back at the office. Jerry passed away in 2005 after battling cancer and heart problems. His father and his grand parents left him money and praised him to make a difference in the world. Frentz resigned from corporate america and formed what is now the Helping Hands Network. Before he could even begin planning to invest his inheiritance, his business partner emptied the companies bank account and Tim was faced with a massive decision. Either pay his staff that dedicated their days to his company or, turn his back on them and retain his funding for the non-profit endeavor. Tim choose the right thing and paid the staff. He then established the netvibes.com/HelpingHandsNetwork website and social media to enable those in need of help with all the contacts available to provide the needed support. 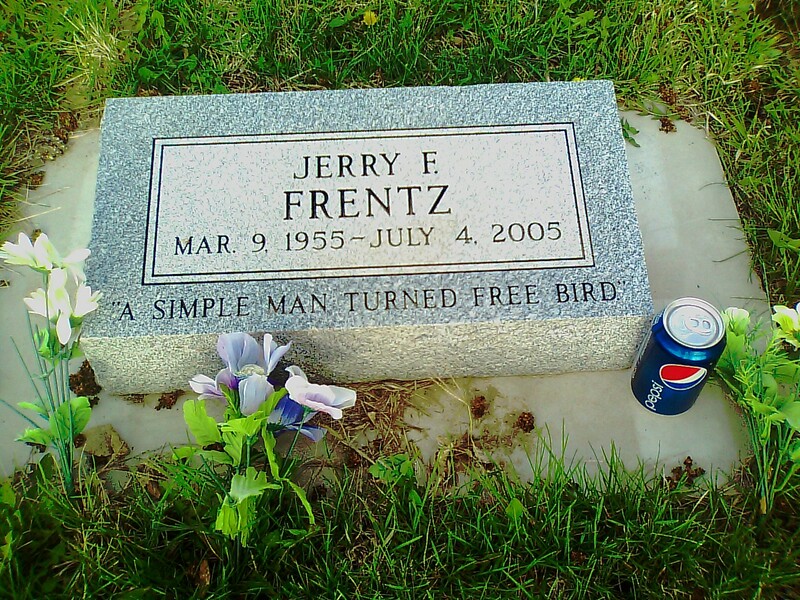 Frentz then liquidated the company and sold as much of his personal items as he could before packing his van and motorcycle up for life on the road. And on the road he has remained since 2007. The first destination was to help a man in deep depression in MN. His wife had died from a seizure when a doctor gave her the wrong type of medicine and his home burned down shortly after. The next stop was in rural northern Nebraska. Tim would spend a year helping form several renewable energy ventures with a man whom was trying to do the best he could alone. This time also allowed Frentz many opportunities to volunteer on the areas Native reservations and to help local farmers with construction projects. In 2009, Tim turned south and followed the rivers until reaching New Orleans where he would spend a month aiding hurricane Katrina victims. He was asked to speak at a conference at the VoDoo Festival and then with the same promoter at Austin’s South By Southwest. 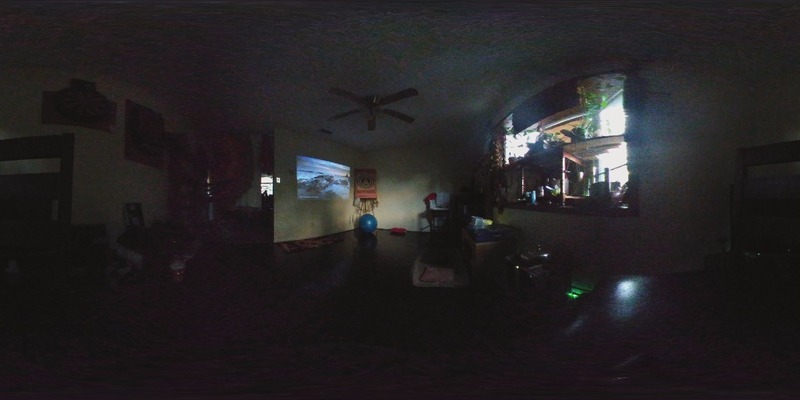 From Texas, Frentz was sponsored to visit LA and the Island of Maui and research the negative effects of United States capitalism on the native Hawaiian culture. Other projects included volunteering with local groups such as the Save Venice Beach Boardwalk Coalition. In late 2010, he returned to projects between Nebraska and Texas. 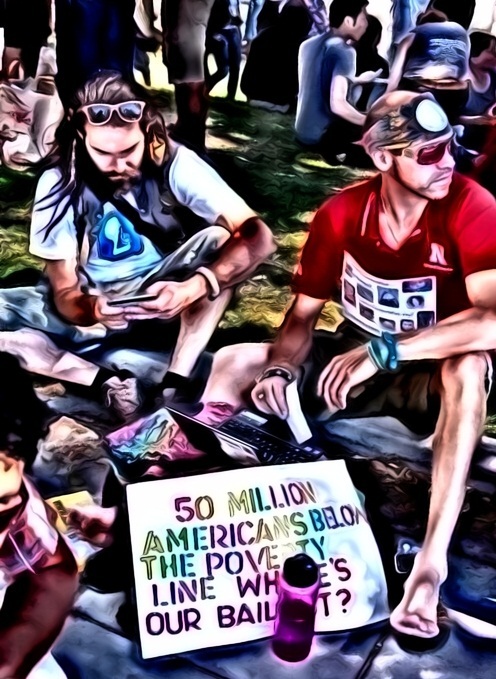 His help was then needed back in L.A.
Tim had just arrived in Los Angeles in 2011 when the Occupy movement began. 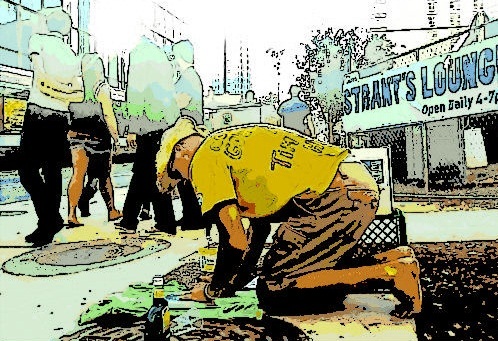 Most of the fall, Tim dedicated his efforts to Occupy related events and causes. Here you see him and friends protesting for fair health care and middle class wealth distribution. 2012, provided many opportunities to give back to the lower class communities in East L.A. Tim volunteered with the city tree nursery and helped coach youth soccer. He was then requested to help with his current project in Nebraska where he is helping battle unfair debt practices by the IRS and friends with medical emergencies. More details can be discovered in the “Helping Hands” Comics and Frentz’s current book called “the Helping Hands Yogi”. The HHN is leading a team over a several week period to assist in fire emergencies. There will be several phases of this project and the estimated over all costs will be about $25 per volunteer in addition to $1500 a week in equipment and material expenses. 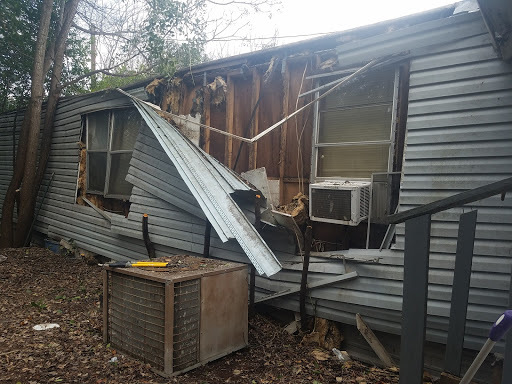 Many of those effected are now homeless and being forced to wait for a government approved hazardous waste cleanup crew to clear each site before volunteers can come in and start salvage, cleanup and rebuilding. PLEASE repost this link on your social profiles and Contact us today if you want to get involved. If you are a fire victim who needs assistance click on the ASK 4 HELP tab at the top of the page. 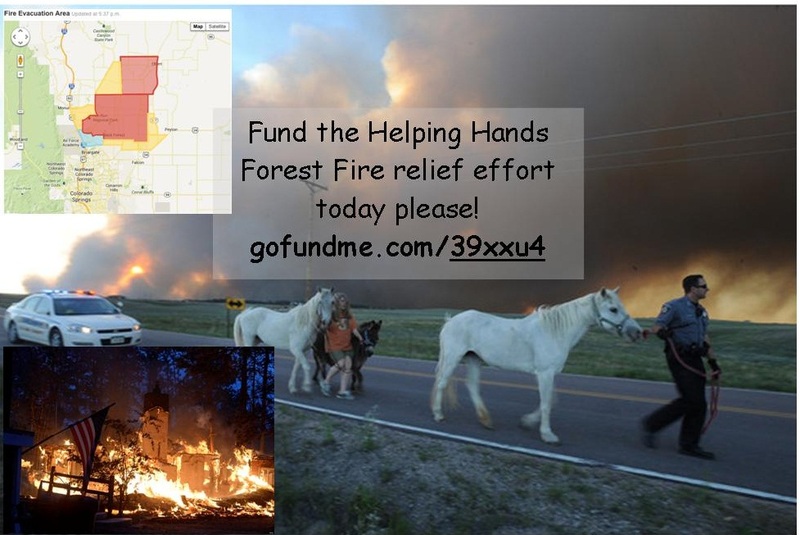 Our group and the families we are helping will need campers, chainsaws, skid loaders, hauling trailers, food, water, generators, fuel, gift cards and camping equipment. REBUILD – Groups will start rebuilding in mid July. Add our facebook page to stay posted for exact dates and times or book mark this page. 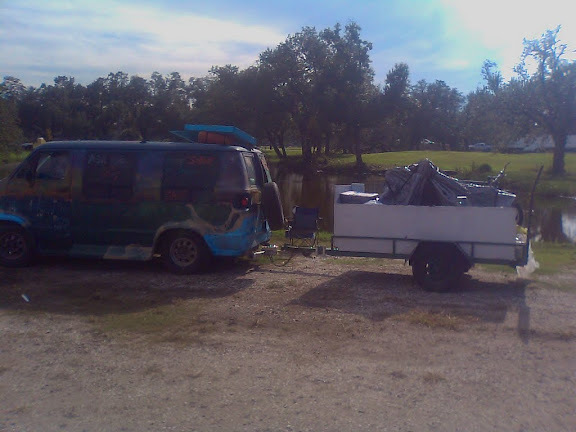 Morning: We met with those we are helping and toured the burn areas and then toured location of the temp home setup. We spent morning collecting and delivering animal items with the Black Forest Saddle Club donation drive. 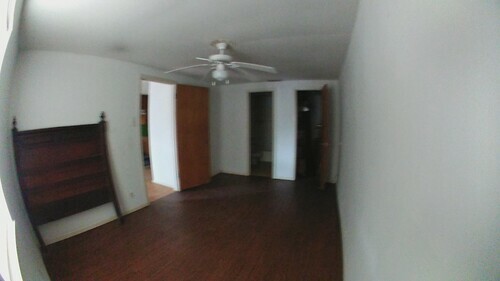 Afternoon: Spent replacing some double doors in the temp home. Evening: Had some fun with the host family at a rodeo fundraiser event and then setup sleeping quarters in the garage at the temp home. Morning: Finished temp home door install and tile work. Fixed leaky roof. 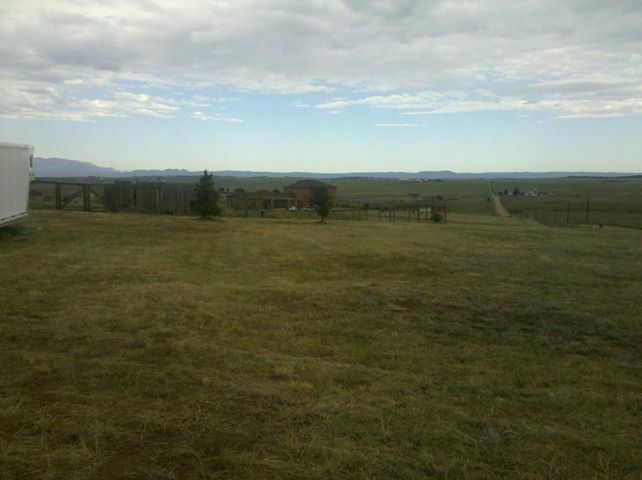 Evening: Started horse fencing project at temp home.